This is one of the basic knots that is very reliable for a number of uses in pioneering work. It is easy to tie and untie and does not reduce the strength of the rope due to sharp turns when under a hard pull. You start by making a roundturn. This provides extra surface around the spar when chafing or slipping might be a problem. Once you’ve made the roundturn, the rope has a grip on whatever it’s around (see 1). The strain on the rope can then be adjusted before finishing off with two half hitches (see 2 and 3). The knot is well suited for both ends of a guyline. When it is used in a place where you will not have easy access, as at the top of a tower, secure the running end, (after the two half hitches are tied) with a piece of light cord. It can be tied in the middle of a long rope by making a long bight with enough rope to make two half hitches after the roundturn. 1, 2, and 3 (below) illustrate the half hitches tied loosely. In actual use both half hitches are pulled up tight. 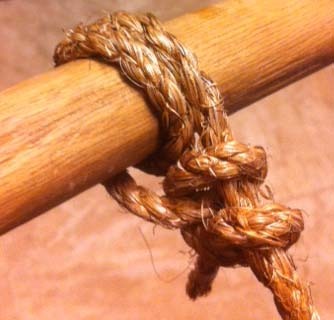 To make the knot, start by making a roundturn over a spar. Next, make a half hitch around the standing part of the rope. Then make another half hitch. When both half hitches are made, pull them tight, and secure the ends with a small cord. At both ends of large hand and foot ropes for a monkey bridge. Be sure to secure the running ends with a light cord. When wear is a factor when tied to an iron ring. For guylines because it does not jam, and is easy to untie when adjustments are needed.